As many of you know, music is a very big part of young children's lives. They really seem to be able to associate with it. They can learn better with it, and they just plain enjoy it. 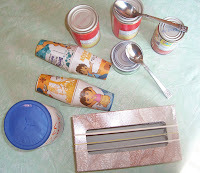 It is very easy to make some "musical" instruments right in your own home. Most of these things may not be new, but sometimes it's good to have a "refresher" course. 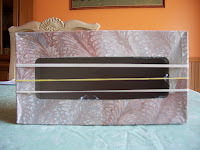 To make this guitar all you have to do is stretch some rubber bands length wise around the box and strum. You can attach a paper towel tube for the handle, but I haven't had luck with it actually staying attached. Cut a piece of construction paper wide enough to cover the can. 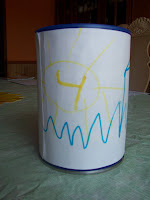 Let the children decorate the paper with marker or crayon, then glue the paper to the outside of the can. Ta-dah--you have a drum. 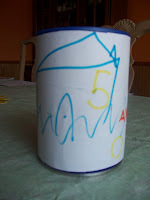 Have the children decorate the cups if they are blank. You can use crayons and marker for paper cups. 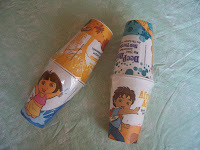 The plastic cups will probably need glue and other art medium to glue to the cups. Have the children fill one half of one cup with your shaker material. 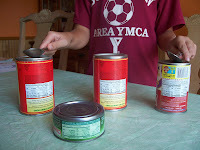 Then use the packing tape to tape the cups together. Now go ahead and SHAKE! You can also use two paper plates. Decorate the bottoms of the plates then use a stapler to staple the edges together--staple closely to keep the shaker material inside. Leave one spot open, fill with shaker material, finish stapling up and SHAKE. 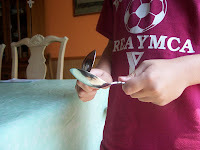 Some other items that might be fun: two spoons to clang together, or some cans--like soup cans--and spoons to bang and make a great noise. Clean empty cans make better sounds than filled cans. Now you have some great instruments to make some "beautiful" music. What great ideas! 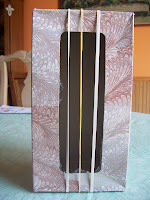 I use the cardboard tubes from paper towels and toilet paper to make shakers. I fill them with rice or beans. Then I tape the ends. It works well. Thank You for reviewing my site.